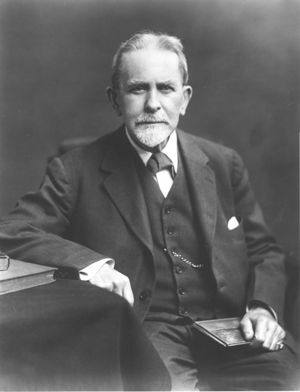 Today is the birthday (1854) of Sir James George Frazer OM FRS FRSE FBA whose evolutionary theories of social anthropology were very influential in the late 19th and early 20th centuries, and his work is still popular in some quarters, although it has been thoroughly superseded within the profession. 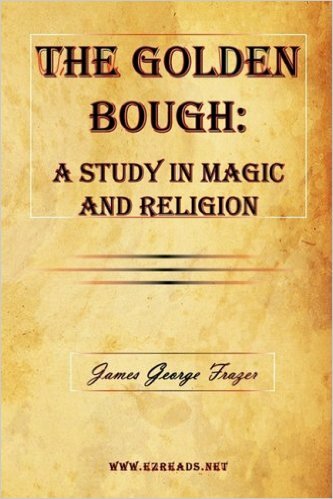 His most famous work, The Golden Bough (1890), documents and details the similarities among magical and religious beliefs around the globe. Frazer posited that human belief progressed through three stages: primitive magic, replaced by religion, in turn replaced by science. The two great weaknesses of Frazer’s work as an anthropologist is that he did no fieldwork, and, hence, was oblivious to the importance of context when assessing social behavior. Frazer was born in Glasgow, and attended school at Springfield Academy and Larchfield Academy in Helensburgh. Thence he studied at the University of Glasgow and Trinity College, Cambridge, where he took an honours degree in Classics and remained a Classics Fellow all his life. From Trinity, he went on to study law at the Middle Temple, but never practiced. Frazer was elected 4 times to Trinity’s Title Alpha Fellowship, and was associated with the college for most of his life, except for a year, 1907–1908, spent at the University of Liverpool. He was knighted in 1914, and a public lectureship in social anthropology at the universities of Cambridge, Oxford, Glasgow and Liverpool was established in his honor in 1921. He was, if not blind, then severely visually impaired from 1930 on. He and his wife, Lily, died in Cambridge within a few hours of each other. They are buried at the Ascension Parish Burial Ground in Cambridge, England. Except for visits to Italy and Greece, Frazer was not widely travelled. His prime sources of data were ancient histories and questionnaires mailed to missionaries and imperial officials all over the world. Frazer’s interest in social anthropology was aroused by reading E. B. Tylor’s Primitive Culture (1871) and encouraged by his friend, the biblical scholar William Robertson Smith, who was comparing elements of the Hebrew Bible with Hebrew folklore. Frazer was foundational in what became known as the “myth and ritual” school, which was very influential in both social anthropology and Biblical studies for many decades into the 20th century. I have my own issues with the definition of “myth” which I will set aside for the moment. Frazer did at least posit a crucial link between sacred narrative and ritual in culture which is somewhat enduring. His generation’s choice of Darwinian evolution as a social paradigm, interpreted by Frazer as three stages of human progress—magic giving rise to religion, then culminating in science— is entirely bankrupt. All cultures contain all three paradigms at all times, though different cultures place different emphasis on each, as do individuals within those cultures. 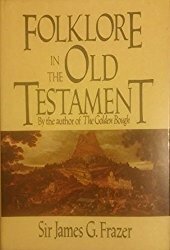 The Golden Bough, contains a wealth of data on cultural practices worldwide (of questionable accuracy) with the general sub-text that early Christianity is just one of a number of religions based on the concept of a dying a rising god, with a lot of overlapping details as well. The first edition, in two volumes, was published in 1890. The third edition was finished in 1915 and ran to twelve volumes, with a supplemental thirteenth volume added in 1936. He published a single-volume abridged version, largely compiled by his wife Lady Frazer, in 1922, with some controversial material on Christianity excluded from the text. The work’s influence extended well beyond the conventional bounds of academia, inspiring the new work of psychologists and psychiatrists. Sigmund Freud cited Totemism and Exogamy frequently in his own Totem and Taboo: Resemblances Between the Psychic Lives of Savages and Neurotics. This mostly goes to prove that Freud was just as wrong in this regard as Frazer, every bit as much as Marx was wrong when he relied on the evolutionary theories of Lewis Henry Morgan. The symbolic cycle of life, death, and rebirth which Frazer found in the sacred stories of many peoples captivated a generation of artists and poets. Perhaps the most notable product of this fascination is T. S. Eliot’s poem The Waste Land (1922). Also Jim Morrison in his “Celebration of the Lizard” (finally titled “Not to Touch the Earth” as a song within the Waiting for the Sun album of 1968) included lyrics such as “not to touch the earth, not to see the sun” — sentences which serve as chapter titles in Frazer’s work. More recently, Frazer’s work influenced the ending of Francis Ford Coppola’s film, Apocalypse Now (1979) (a copy of The Golden Bough is shown in one of the final shots). Frazer was from Glasgow and today is Hogmanay, so a traditional Scots recipe is in order. Here is potted hough, an old favorite of mine. “Hough” is Lowland Scots for “shin” which is a very cheap cut of beef because it is so tough (veal shin is used in ossobucco). Beef shin is very tasty but requires long, slow cooking. 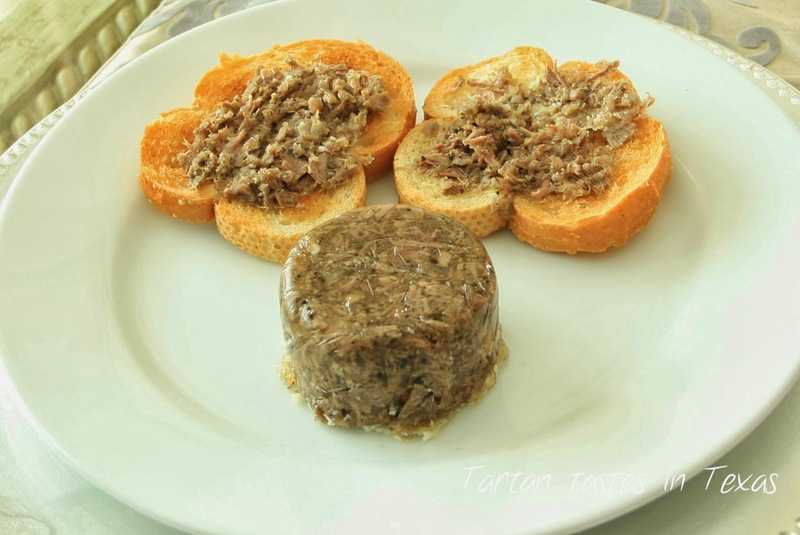 Potted hough is served cold, and makes a great dish on a New Year’s Day buffet spread. Put the meat in one piece with the bone and seasonings to taste into a large saucepan. Cover with beef stock and bring to a very gentle simmer. Skim as needed and keep on a gentle simmer for around 6 hours. Refrigerate overnight with the meat separate from the broth. In the morning skim off the fat from the broth and return it to the heat. If it did not gel overnight, reduce as you think fit. Strip the meat from the bone and shred it finely. Add it back to the stock, check the seasonings, then simmer for a few minutes. Grease a few small moulds or dishes and divide the mixture between them. Pack the meat tightly, then chill to set. Unmould and serve with bread or toast.